­Lucie Bagg, half-sister to my three-times great grandfather Stanley Bagg, has represented a brick wall for me ever since I started genealogy. I had never heard of her, or of her two half-sisters, before I started to research the Bagg family. I found a record of her baptism in La Prairie, Lower Canada (now Quebec),1 but that was it. Lucie Bagg was born on 11 Jan. 1798 in La Prairie, Lower Canada to American-born, Protestant parents, but since there was no Protestant church in the town, she was baptized in the local Catholic church. The priest who recorded her baptism was French-speaking and he used the French spelling of Lucy in the register. Lucie lived much of her life in the United States and appears in census records as Lucy, but to her family in Canada, she remained Lucie. My cousin inherited this pin but did not know who Lucie was. It has now been lost. Lucie’s father, innkeeper Phineas Bagg (c. 1750-1823), had moved to La Prairie, on the banks of the St. Lawrence River near Montreal, from Pittsfield, Massachusetts with his four children by his now- deceased first wife and with Lucie’s mother, who was probably Ruth Langworthy.5 He had fallen into debt in Pittsfield and lost his farm to repay his creditors, so he had come to Canada to start a new life.6 La Prairie was then a prosperous town on the route between Montreal and New England, and a number of Americans lived there. By 1810, Lucie’s half-siblings were beginning to launch their careers and marry. Phineas and son Stanley moved onto the island of Montreal and opened the Mile End Tavern at a crossroads about a mile north of the city.7 The Mile End property was a farm as well as a tavern, and perhaps Lucie helped feed the animals or serve the tavern guests. In 1816, when she was 18, she married William Kaene, a 19-year-old Pennsylvania-born farmer, somewhere in or near Buffalo. At that time, Buffalo was a village on the eastern shore of Lake Erie. Several years earlier, during the War of 1812, British troops had burned it. In 1825, the Erie Canal linking Lake Erie with Albany and the Hudson River was completed. 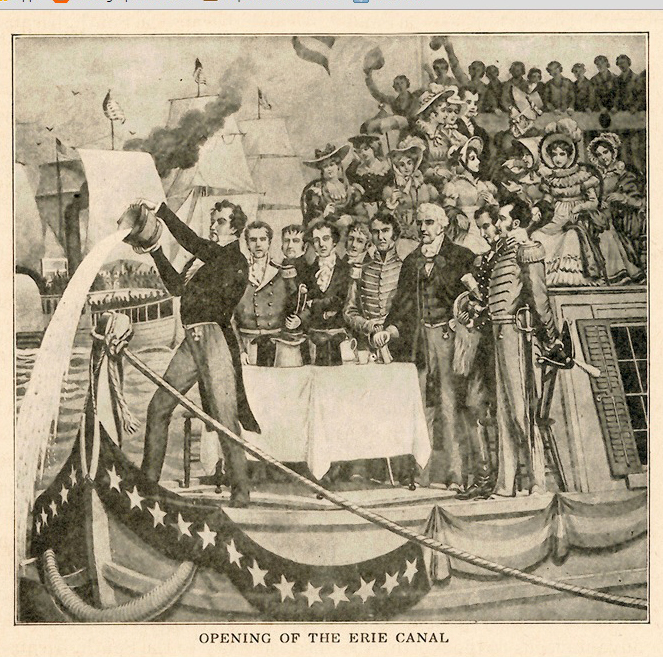 Perhaps Lucie attended the canal’s opening ceremonies in Buffalo, the waterway’s western terminus.8 The canal gave a big boost to Buffalo’s economy as the town became a transfer point for both passengers and goods. An ad in the 1850 Buffalo city directory. “Opening of the Erie Canal” engraving of a print by Howard Pyle (1853-1911), from The Evolution of New York: by Thomas A. Janvier. 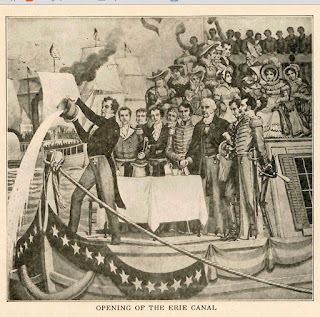 www.eriecanal.org, accessed Feb. 28, 2016. This article is also posted on www.genealogyensemble.com. 1. “Quebec, Canada, Vital and Church Records (Drouin Collection), 1621-1968” [database on-line]. Ancestry.com, (www.ancestry.ca, accessed 27 Feb. 2016), Gabriel Drouin, comp. Drouin Collection. Montreal, Quebec, Canada: Institut Généalogique Drouin. 2. Labadie, Joseph-Augustin, # 14278, 18 Mai 1856. Bibliothèque et Archives nationales du Québec. 3. “Early Settlers of New York State, Their Ancestors and Descendants”, extracts from Vol. 2, No. 12 (June 1936) Akron, NY: Thomas Foley. Genealogical Research Library, comp. New York City, Marriages, 1600s-1800s [database on-line] (www.Ancestry.ca, accessed Feb. 27, 2016). 4. 1860, Buffalo Ward 10, Erie, New York; Roll: M653_748; Page: 729; Image: 157; Family History Library Film: 803748. Ancestry.com. 1860 United States Federal Census [database on-line]. Provo, UT, USA: Ancestry.com Operations, Inc., 2009. Images reproduced by FamilySearch. There are two errors in Ancestry.com’s transcription of this census entry: Lucy’s last name was transcribed Kene instead of Kaene, and her age was copied as 68 rather than 62 as the census taker had written it. The original census entry reads, Lucy Kaene, age 62, born Lower Canada. 5. It is not clear whether Lucie’s mother’s name was Ruth or Lucy. I will write about her soon in another post. 11. Ella was born Nov 19, 1836 according to her 1865 christening record: "New York Births and Christenings, 1640-1962," [database] FamilySearch (https://familysearch.org/ark:/61903/1:1:FDLB-NYM (accessed 27 February 2016), Ella La Fontaine, 19 Nov 1836; citing reference 2:112NCB1; FHL microfilm 1,378,628. Ella was 29 years old in 1865 when she was christened at Grace Episcopal Church, Buffalo. Ella was not listed on the 1850 U.S. Federal Census, but she did appear with the rest of the family on the 1860 U.S. Federal Census and the 1865 State Census. Perhaps she was adopted. 12. The 1850 census mentioned a daughter Johanna but I have not found any other mention of her. Also, the transcription of the 1850 census on Ancestry.ca incorrectly lists two other family members, Catherine and Fred. The census gatherer did not write down last names for these people, so they can be mistaken for family, however, Fred was identified as a labourer born in Ireland, while Catherine was born in Germany and may have been a domestic servant. 13. “Public Member Trees,” [database] www.Ancestry.ca, Adams Family Tree, Stuart Lauters compiler (accessed 28 Feb. 2016), http://person.ancestry.ca/tree/16093254/person/341207597/facts. This is a well-sourced public member tree on Ancestry.ca for Lucie Bagg and her family. 14. “John Cowing Revolutionary War Soldier” provided by Joe W. Cowing, 2002, submitted by Dolores Davidson, www.rootsweb.ancestry.com/~nychauta/Families/Jcowing.htm (accessed 1 March, 2016). Harrison Otis Cowing (1814-1839) is part of generation 7 in this family tree. His son Stanley Bagge Cowing, born 1844, may have been named after Lucie’s brother Stanley Bagg. 16. 1850, Buffalo Ward 5, Erie, New York; Roll: M432_502; p. 491B; Image: 486. Entry for William Kaene; digital image. Ancestry.com (www.ancestry.ca; accessed 28 Feb. 2016), 1850 United States Federal Census [database on-line]. Images reproduced by FamilySearch. There is a transcription error on Ancestry: the family is indexed as Rane, rather than Kaene. 17. “Public Member Trees,” [database] www.Ancestry.ca, Adams Family Tree, Stuart Lauters compiler (accessed 28 Feb. 2016), http://person.ancestry.ca/tree/16093254/person/762097336/facts. 18 New York, State Census, 1865 [database on-line]. Ancestry.com (www.ancestry.ca, accessed 28 Feb. 2016), Census of the state of New York, for 1865. Microfilm. New York State Archives, Albany, New York. Note the census-taker erroneously spelled the family name Kane. 19 “Public Member Trees,” [database] www.Ancestry.ca, Adams Family Tree, Stuart Lauters compiler (accessed 28 Feb. 2016), http://person.ancestry.ca/tree/16093254/person/1077026843/facts.